I may have mentioned a while back that a friend of mine generously donated a couple of nut and saddle blanks – one set in Corian and one set in ebony. I already used the Corian nut blank to make a raised nut for playing slide guitar (as seen HERE). Now it was time to put the ebony to use. My acoustic only came with a plastic nut and saddle, so I was keen to see what sort of a difference this would make (to be discussed later). The first thing I should mention here is that ebony is a very difficult wood to work with. The only thing I can compare it to is frozen chocolate. It’s extremely hard, but it’s still possible to chip bits off the edge quite easily, so you have to be very careful, patient, and have very sharp tools. First thing to do was to remove the old nut and saddle to use as a template. These were then traced around on the nut and saddle blanks. Let’s look at the process of making the saddle first. The nut also needed to be thinned to fit into the nut slot. This was done in the same way as the Corian nut HERE. The sound is definitely different. The wound strings appear to have more depth and seem to have more sustain too, whereas I was a little disappointed with the unwound strings initially, though they seem to have come to life now. Overall I like the sound, though I would like to also try bone, so don’t be surprised if you see another similar post somewhere down the road. Today we're going to talk about how to wire up a stompbox. Apart from the effects circuit itself, there are three things that have to be thought about when wiring up a stompbox, which are the stomp switch, the stereo input jack and the DC-in connector. 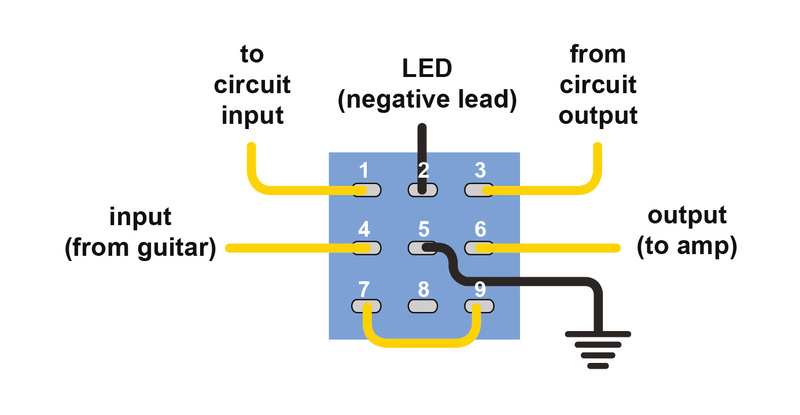 To try to make this easy to follow, consider the left-hand column of the switch to be the input column, the middle column to be the LED column, and the right-hand column to be the output column. If for any reason you only have a 6-pin switch, you can still use it, just without the LED column. In the OFF position, pin 4 is connected to pin 7, pin 5 is connected to pin 8, and pin 6 is connected to pin 9 (in my diagram at least – you may have a switch with different numbers written on it, though often they have none at all). Looking at just the left and right columns, the input comes in from the input jack via the yellow wire connected to pin 4, is directed downwards to pin 7, which is shorted to pin 9 via the jumper wire, then this is redirected up to pin 6 which is connected to the output jack. In other words, a bypass is in operation. 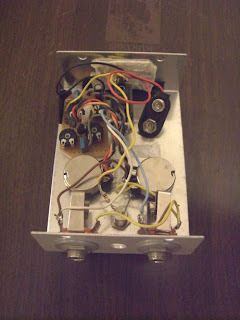 As the effects circuit itself is completely disconnected, it cannot influence the signal, so this is true bypass. As for the middle column, there is not much going on there. The ground/earth wire is connected to pin 5, but it is not redirected anywhere, so nothing happens, and the LED does not light up. In the ON position, pin 4 is connected to pin 1, pin 5 is connected to pin 2 and pin 6 is connected to pin 3. Again, looking at just the left and right columns, the input again comes in from the input jack via the yellow wire connected to pin 4, is directed upwards to pin 1, which then goes to the input of the effects circuit. 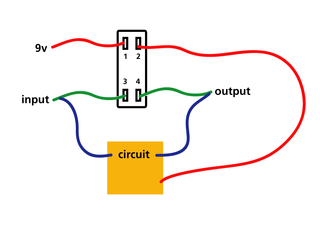 The output of the effects circuit goes to pin 3, and this is redirected down to pin 6 which is connected to the output jack. As for the middle column, the ground/earth wire is connected to pin 5, which is redirected up to pin 2 and fed to the negative terminal of the LED, allowing it to light up. OK, that’s the switch explained, but there’s more going on here. You may be wondering why a stereo input jack is required, when you are only using a mono signal. Well, that’s because the third connector (pin 3) on the input jack is used to control the power supply to the circuit. Let’s assume for a moment that you are using a battery. Instead of the negative of the battery being connected straight to the negative of the effects circuit, which would mean the battery is in use ALWAYS (even when the circuit appears to be switched off), the negative of the battery is instead connected to the third connector (pin 3) of the stereo input jack. That way, when nothing is plugged into the stomp box, the third connector is not connected to anything and the battery is not being used. 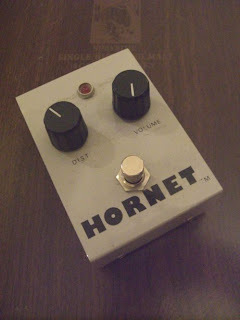 When you plug in a mono jack plug, it shorts the third connector to the shield/sleeve connector (pin 1) of the socket, which in turn connects it to earth/ground, powering the effects circuit. You may wonder why you don’t just power up the battery at the same time as switching on the effects circuit. Without going into too many details, this is because the sudden surge of power leads to a loud popping noise, which no-one wants to hear. Lastly, we have the (5.5 x 2.1mm) DC-in connector. This also has three connectors and can sometimes cause confusion, since instead of having a positive inner (centre pin/tip), which would be the norm for most electronic items, it actually has a negative inner. I’ve numbered the pins in the diagram for clarity, as follows: pin 1 is the (negative) inner/pin/tip and is connected to the negative of the battery, pin 2 is the outer (sleeve) and is connected to the positive (+9v) of the effects circuit, and finally in a similar way to the stereo input jack, pin 3 is the 3rd, extra, pin and is connected to the positive terminal of the battery. When nothing is plugged in, the positive terminal of the battery, which is connected to pin 3, is shorted to pin 2, and continues on its way to the positive of the effects circuit. 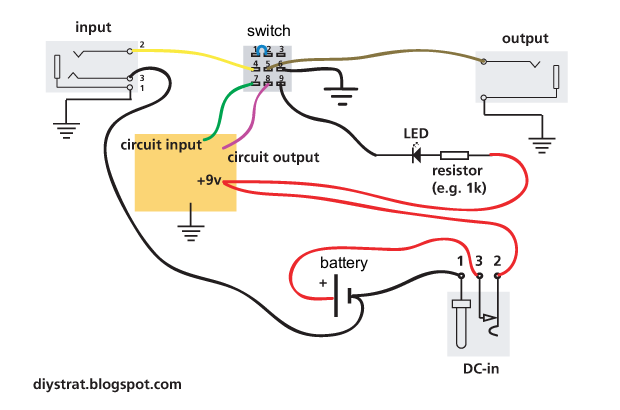 When the power supply is plugged in, however, pin 3 (and therefore the positive of the battery) is disconnected, and the positive voltage from the power supply goes directly to the effects circuit via pin 2. One more thing to note is that since the DC-in socket has a positive outer, it should be one with a plastic surround, so that the outer does not make electrical contact with the enclosure (which is grounded/earthed). With thanks to CheopisIV (http://www.stuntmonkeypedals.com/) and bugg over at the mylespaul forums for clearing this up, it is a wise idea to ground the input of the circuit itself when not in use (in other words, while it is being bypassed). 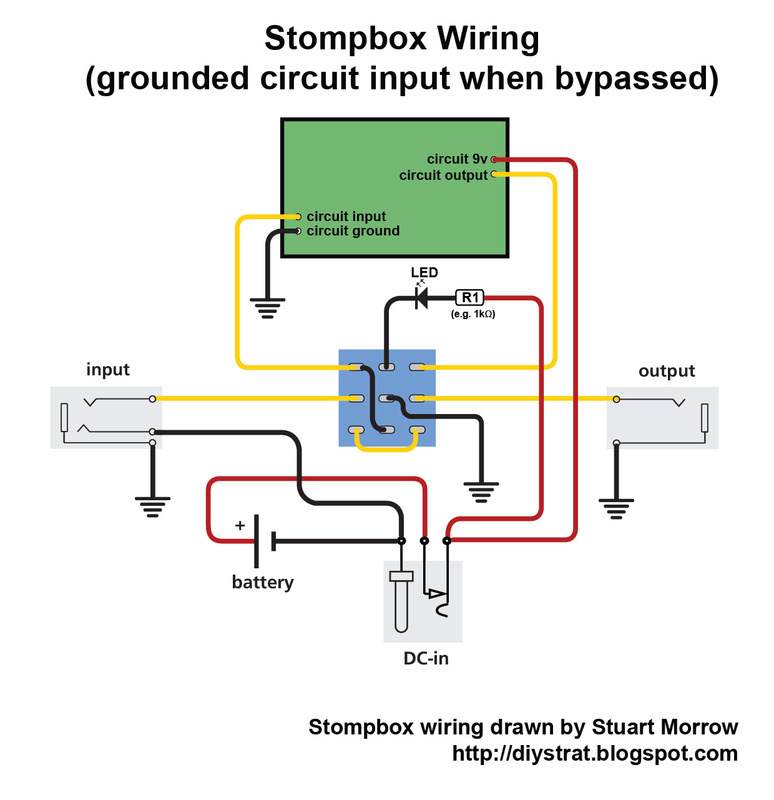 Without a grounded input, the input signal can float all over the place and by the time it gets amplified through the circuit, there can be quite a large uncontrolled signal in there. Now theoretically this wouldn't be connected to the output socket, since the circuit is being bypassed, but the noise can be picked up by other means, and so it is safer to just avoid it if possible. While the circuit is bypassed, the circuit input is connected to the ground wire going into the centre pin (pin 5) of the switch. When the switch is engaged, this connection is broken and the circuit just works as previously described.